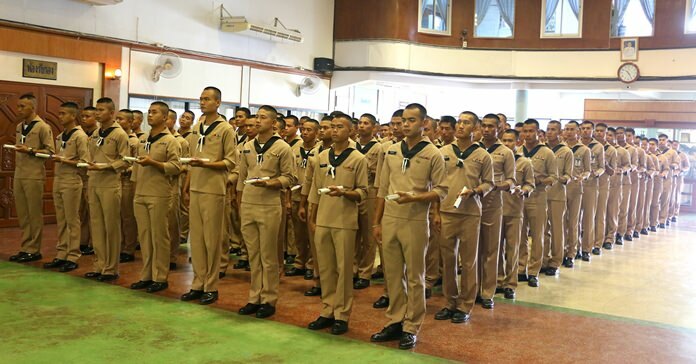 More than 100 sailors recited their oath to be a good citizen, behave properly, adhere to religious morals, protect the monarchy and keep the government’s secrets as they ended their tours of duty. Top Royal Thai Navy officers wished more than 100 sailors good luck as they ended their tours of duty. Vice Adm. Sukiti Sa-ngiemphong presided over the Oct. 31 ceremony marking the end of the conscription period for 138 sailors. Before returning to private life, the servicemen recited their oath to be a good citizen, behave properly, adhere to religious morals, protect the monarchy and keep the government’s secrets. They also pledged to return to active service if called upon while on reserve duty. Vice Adm. Sukiti said military service was good life experience that instilled discipline, strength and responsibility in the sailors, lessons that will serve them well in the private sector.